Sudden vision loss without pain is the most common symptom of a stroke involving your eye. An eye stroke, or anterior ischemic optic neuropathy (AION), is a condition in which blood flow either becomes blocked or reduced to the tissues of the front part of the optic nerve. An eye stroke can cause sudden loss of peripheral vision, distorted vision, and blind spots in your vision, and while it may be frightening, prompt medical attention can prevent or limit vision loss. People with eye stroke are usually given little warning. Most people with eye stroke notice a loss of vision in one eye upon waking in the morning, with no pain. Some people notice a dark area or shadow in their vision that affects the upper or lower half of their visual field. Other symptoms include loss of visual contrast and light sensitivity. Depending on the area of the eye where blood flow becomes blocked or reduced, the following occlusions may occur. Central retinal artery occlusion (CRAO): This occlusion usually occurs with sudden, profound vision loss in one eye, with no pain. It occurs in the retina. Central retinal vein occlusion (CRVO): Usually causing sudden, painless vision loss that can be mild or severe, this blockage occurs in the central retinal vein where it enters the eye. Branch retinal artery occlusion (BRAO): This blockage is usually painless and occurs suddenly. The patient usually loses peripheral vision, and sometimes central vision as well. Underlying causes include narrowing of the carotid artery, high blood pressure, cholesterol disorders, and/or cardiac disease. Branch retinal vein occlusion (BRVO): This type of blockage causes bleeding and clotting along the retinal vein It may result in decreased vision, peripheral vision loss, distorted vision, or blind spots. This type involves one eye and may be caused by high blood pressure or diabetes. The key symptom of GCA-associated AION is painless blurriness or vision loss lasting for minutes or hours before the loss becomes permanent. Unless diagnosed and treated immediately, the vision loss may be massive and irreversible. Eye stroke is caused by poor circulation in the blood vessels that supply the front portion of the optic nerve. The optic nerve is the cable that connects the brain to the eye and carries millions of nerve fibers and blood vessels. Although an eye stroke can occur from a total blockage of a blood vessel that feeds the optic nerve, it is more commonly caused by a lack of pressure or perfusion of the tissue. Blood pressure may change relative to the eye pressure and the normal flow of blood is reduced. If the optic nerve's nutrient and oxygen supply is cut off, nerve tissue is damaged and lost, resulting in vision loss. Eye stroke is more common in middle-aged people and the elderly. In fact, less than 10 percent of people affected with AION and GCA-associated arteritic AION are under the age of 45. Cardiovascular disease raises your risk of developing the disease. In some patients with cardiovascular disease, blood pressure falls markedly while sleeping. This low blood pressure reduces circulation through those arteries, increasing the chance of eye stroke, so reducing your risk of cardiovascular disease can overall help reduce your risk for eye stroke. Certain optic disc shapes can also raise your risk of eye stroke. Nerve fibers that travel to the brain and down the optic nerve must enter the eye through a hole called the optic foramen. If this hole is smaller than average, the nerve fibers can become crowded. When they become crowded, the risk of developing an occlusion increases. Although the relationship is not well understood, people who have significant cardiovascular disease and also take the drug Viagra are more at risk for the disease. 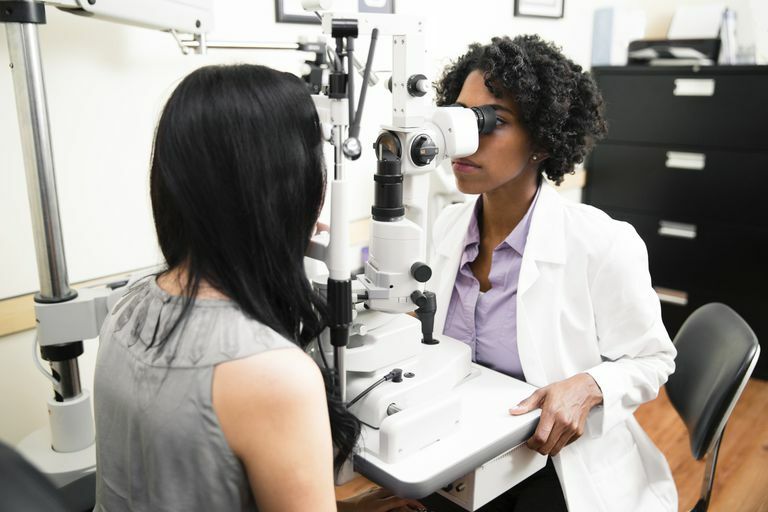 If your doctor suspects eye stroke, he or she will review your medical history and ask about cardiovascular disease and conditions you may have such as diabetes, hypertension, or high cholesterol. Your blood pressure will be measured, as well as your central visual acuity and visual field. Your doctor will usually dilate your eyes to examine your optic nerve and retina. Your doctor will also examine your optic nerve to check for pale color or possibly optic disc swelling. Your normal eye will be compared to the affected eye to detect changes. Your doctor will also carefully rule out arteritic ION (a serious eye stroke affecting the optic nerve) and ask about symptoms such as fever, headache, scalp tenderness, jaw pain, weight loss, loss of appetite, and fatigue, so be prepared to discuss these points. Corticosteroids have been shown to increase visual acuity in some cases of eye stroke if started early enough, which is why it's crucial to visit your doctor if you notice sudden changes in your vision. Corticosteroids reduce leakiness of the vessels and improve swelling and circulation. They are the treatment of choice in AION because it is an eye stroke that appears to be more commonly caused by reduced blood flow and inflammation, as opposed to a true blockage of a blood vessel from a small particle or emboli. Some doctors may also prescribe drugs to lower eye pressure in hopes to improve blood flow to the optic nerve. Some physicians also feel that newer, more powerful anti-hypertensive medications may reduce blood pressure too low when sleeping, putting people at risk for eye stroke, so make sure to discuss with your doctor if you are on an anti-hypertensive and concerned. There may be a different option available for you. There has been some research on the potential to prescribe medications that act as neuroprotection, that may regenerate nerve fibers in the optic nerve. However, there is no conclusive evidence that these drugs provide any benefit. Other treatment is aimed at controlling cardiovascular risk factors so eye stroke does not occur to the other eye, as there is a 30 percent chance that it will happen to the other eye within three years. Eye stroke is a potentially visually devastating eye disease. Having high blood pressure and carotid artery disease increases your risk of experiencing an eye stroke, so it's important to take the necessary steps to make sure those conditions are in check. If you experience sudden vision loss of any sort, see your doctor immediately or go to the nearest emergency room. Prompt treatment—delivered within hours, not days—is essential to preventing vision loss, particularly if GCA is involved. Janigian, R. American Academy of Opthalmology. Eye Smart. 2015.